Nose: Salty peat (dry earthy peat, not at all medicinal), a bit of that flower-bed smell with mulch and bark, fresh charred wood, and sweet citrus notes. There’s also some berry ice cream, and some peppery notes. Given some time to breath, more fruity notes show themselves, with the earthy notes receding in their wake. Palate: The salty peat is prominent. Citrus flavours and sweet berries are fairly big too. Quite sweet with lots of vanilla, as well as an earthy taste, along with some charred wood and white pepper as well. Mouthfeel: Reasonably thick, although not notably so for an Octomore. Quite dry, with jut a hint of warmth. Despite the dryness, there is a little bit of oiliness to it, and it is almost chewy. Finish: There’s a fairly decent length to the finish, which is pretty dry with the hint of warmth continuing through. Sweet berries with the lightest touch of citrus are still present, although the finish is pretty even with the sweetness matched by the peppery wood notes that are faintly noticeable. This whisky keeps my mouth watering for quite some time. Balance: This whisky is supremely well balanced – sweet, though not particularly sweet, with the pepper and wood notes not over-powering the sweet fruit and vanilla either. The flavour profile evolves slowly over the length of the whisky – never changing course, nor gaining or loosing profiles in a hurry. The weight and mouthfeel of the whisky completely match the flavours. 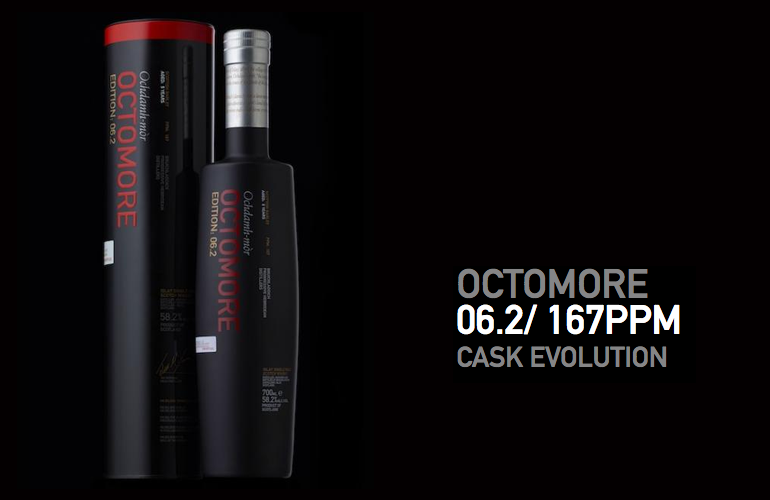 Octomore 6.2 is the third “Cask Evolution” release in the Octomore series from Bruichladdich, after 2.2 “Orpheus”, and 4.2 “Comus”. It seems that with the release of 6.2, Bruichladdich has decided to ditch the names – the 2.2, and 4.2, were the only Octomore editions to have names. Octomore 6.2 is a “travel retail exclusive” whisky, meaning that you can only get it in duty-free stores, and (I believe, although I haven’t been lucky enough to be there for several years) at the distillery. Like most of the Octomores, the 6.2 edition was aged for 5 years in Bruichladdich’s warehouses on Islay, bottled with no colouring, and no chill-filtration. It was peated to 167ppm, and bottled at 58.2%. All of the x.2 Octomore releases, the cask evolutions, are aged in barrels that have previously held liquids other than whisky/whiskey (the x.1 and x.3 releases are predominantly ex-Bourbon barrels). Octomore 6.2 was aged, or matured, in limousin oak casks that previously held Champagne eaux de vie from Aquitiaine. This is a beautiful whisky – not quite an equal to the 2.2 or 7.3 editions, but not far off. The balance in this whisky is phenomenal, and the palate is just delicious. I’ve been through several bottles, and if it wasn’t so damn hard to get (with domestic flights between two cities on the mainland reaching more than 3600km, and freight trains that have reached over 7.5km long, it can be a fair effort to actually depart this country), I’d have undoubtedly gone through several more despite the steep price. As far as I am aware, Octomore 6.2 was the first travel retail exclusive Octomore that Bruichladdich has bottled, and looks like being the way that all future x.2 releases will be sold. Although I can see the commercial appeal in TREs, personally I find it disappointing that Bruichladdich has headed in this direction. Despite being a “limited release”, Bruichladdich produced 18,000 bottles of this whisky, so they can’t even really claim that being a TRE allowed them to release a smaller batch that they would otherwise not be able to do. This isn’t an easy whisky to get your hands on, but if you manage to do so, and you can afford the asking price, definitely grab it and run gleefully away from all the other people so you can enjoy your loot in peace!